Tomorrow is the Winter Solstice — Great Yule, the beginning of the Twelve Days of Yule. In the Hokku Calendar, the Winter Solstice is the point at which the Yin force reaches its maximum — Yin being cold and dark and still. But as you will recall from previous postings here, when either Yin or Yang reaches its maximum, a tiny seed of the other appears within it, and will begin to grow. What that means is that Midwinter is the time when the forces of Yin not only reach their maximum, but because of that, they also begin the long transformation into their opposite, Yang, which is warm and bright and active. So just as Midsummer’s Day is the height of Yang, it is also the point at which it begins to give way to Yin, leading into autumn and winter. And Midwinter’s Day is the height of Yin, but it is also the time at which it begins to give way to that tiny spark of Yang within it, that will take us to spring and summer. And so the Wheel of the Year continues to turn. For our ancestors, Midwinter’s Day was the time in which to celebrate the “rebirth” of the sun — that time when the sun, which had been declining in its course across the sky, would pause, then begin to rise progressively higher in its arc again. So though it is the shortest day of the year, with the longest night, it is also the beginning of the return of the light and warmth, and that was a cause for rejoicing. 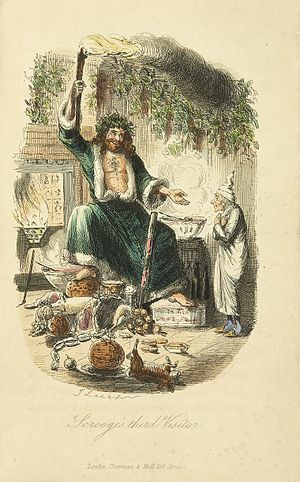 So, however you may celebrate the Midwinter Festival or whatever you may call it, happy Yuletide to all of my readers. So if you find yourself fortunate enough to have abundance, please remember those who do not this Yuletide. Bring a bright, warm spark of happiness into someone’s life. Whatever your circumstances, do your best to be a light in darkness to others. Winter, as I have written earlier, is the most austere season of the year. Because of that, it is a time when contrasts have great significance — warmth amid cold, food amid hunger, shelter amid none, movement amid stillness, light amid darkness, sound amid silence. That is not just the Yuletide season; it is winter. That is why the joy of the holidays has such great significance against the background of winter. I do not think that those who celebrate the great Midwinter Festival — call it Yule or call it Christmas or something else — in countries where the air is warm and there is plenty and abundance in Nature in the month of December, can ever really feel or express the great significance that the holiday has in places where the month is filled with cold, with frost, with snow and ice. Some people make the mistake of thinking that if one celebrates Yule, the “non-Christian” aspect of the holiday, one must forget about everything associated with Christmas. There are even those who feel that people who call the holiday Christmas should not be allowed to wish others, who may not call it by the same name, “Merry Christmas.” The world is becoming too bound by such “politically-correct” rules. My feeling is that such an attitude is quite contrary to the spirit of the season. As I have said, I celebrate the holiday as Great Yule, the Midwinter Festival, the Winter Solstice, but when someone wishes me a Merry Christmas, I wish the same back to them, because underneath it all we are celebrating the same thing: The season when the light is reborn out of the darkness of winter, the season of hope and joy and of realizing our common humanity. To Christians this is expressed in the birth of a miraculous, bright infant who brings peace and joy to the world in the midst of winter. That is essentially the same as for those who celebrate Yule, the time when the days have reached their shortest, when darkness has spread to its greatest length, and then suddenly at the Solstice there is a change, and once again light returns with the promise of another eventual spring. And of course there is even more to it than that, feelings and experiences that touch the deepest parts of our nature. So when I see a nativity scene, I see a symbol. Yes, for some people it can mean a narrow, dogmatic, exclusive attitude, but it should not mean that for us. The practice of hokku goes beyond a dogmatic attitude toward life. That is why I always emphasize that the spirituality of hokku is a non-dogmatic spirituality. It goes beyond beliefs and relies on personal experience. May all beings be happy; may all beings be peaceful; may all beings be liberated. We should never confuse this keeping of the festival well with commercialism, though of course that is what it has become in our time, when people have lost touch with the deeper things of life. It is up to us to find within ourselves what it means to keep the Yuletide season well. It is a part of our spiritual journey.